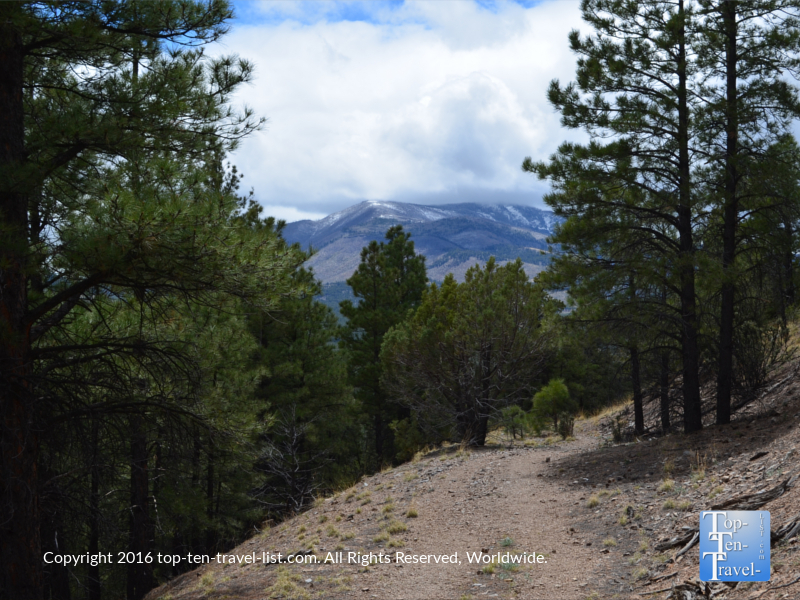 Hiking to the Top of Slate Mountain: The Best Trail Near Flagstaff - Top Ten Travel Blog | Our experiences traveling throughout the US. 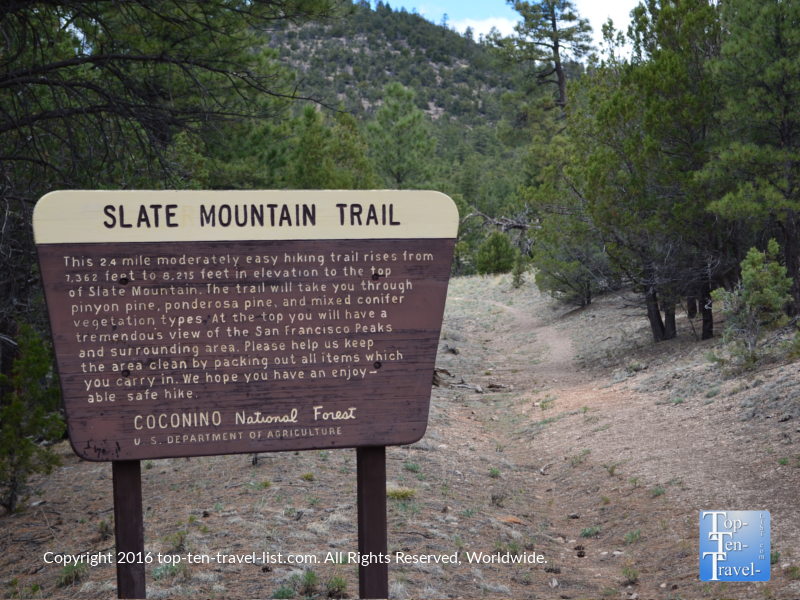 The Slate Mountain Trail, located 40 minutes outside of Flagstaff along Hwy 180 enroute to the Grand Canyon, is one of the area’s most under appreciated hikes. The gradual 2.16 mile climb to the top is quite a workout, although the views are some of the most amazing in the region. 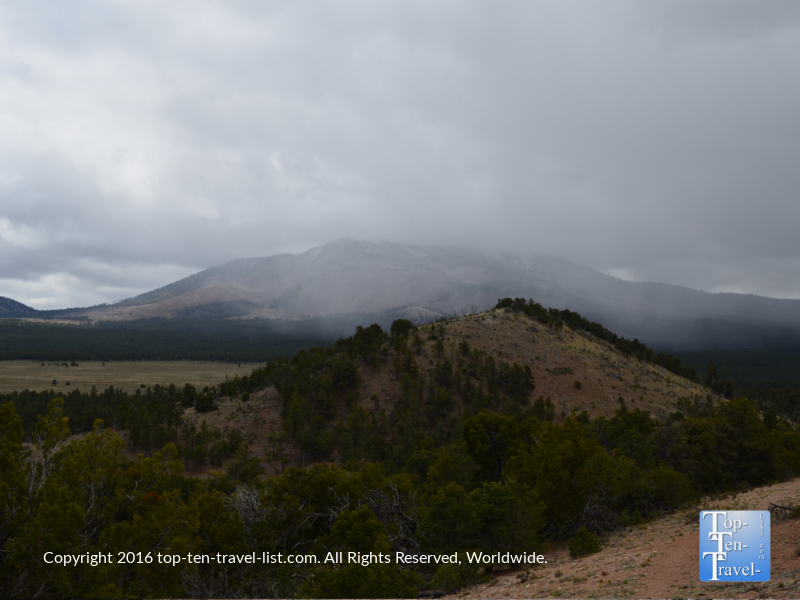 The elevation gain is about 1000 feet, starting at 7362 and reaching 8215 feet at the top. On the bright side, the 2 mile stroll downtown is really easy and allows you recover from that uphill climb while soaking in the mountain scenery! 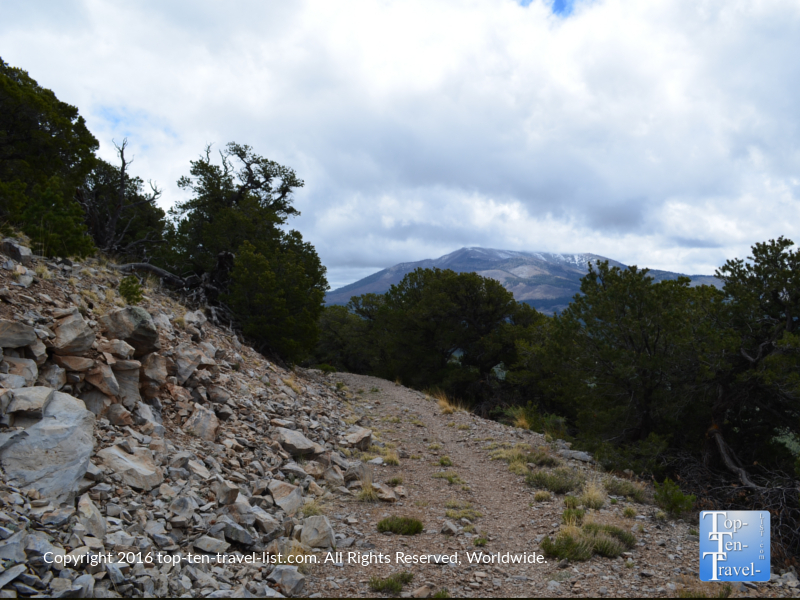 Although the hike is typically rated as easy, you need to be aware that you are hiking in a high altitude area (meaning there is less oxygen to breathe due to the thin air and a greater chance of dehydration) and also going uphill for 2 miles straight! 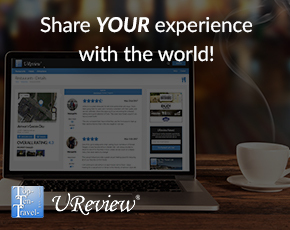 It’s a workout for sure, but one that is worth it for the peaceful atmosphere and fabulous views! 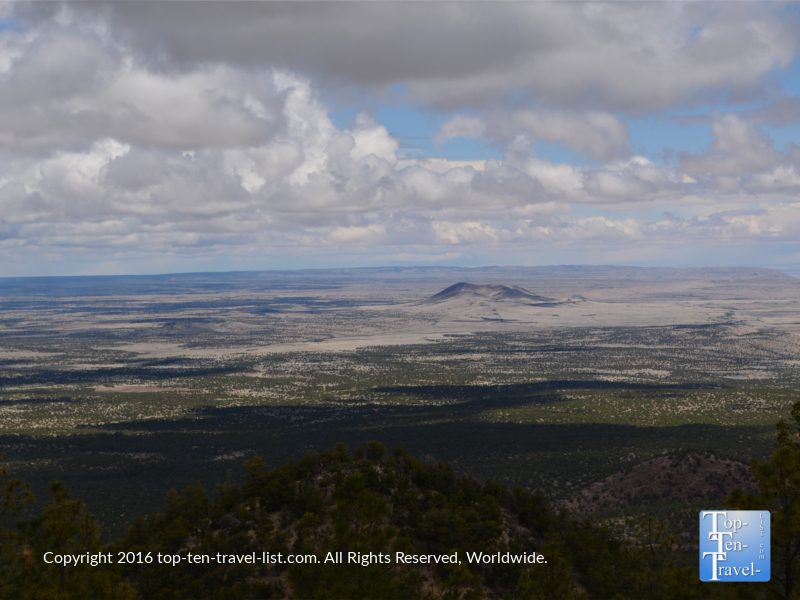 For all that effort,you will be rewarded with gorgeous overlooks of the San Francisco Peaks, Red Mountain, Kendrick Mountain, the Painted Dessert, and even the Grand Canyon! 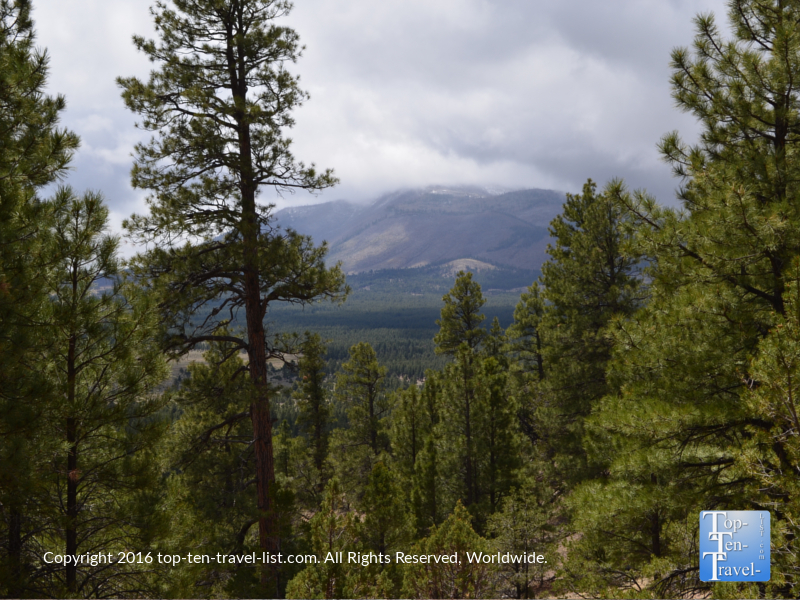 The trek up is quiet and scenic with lots of tall pinyon and ponderosa pine trees, as well as evidence that many animals call the area home (lots of deer and elk prints can be seen). 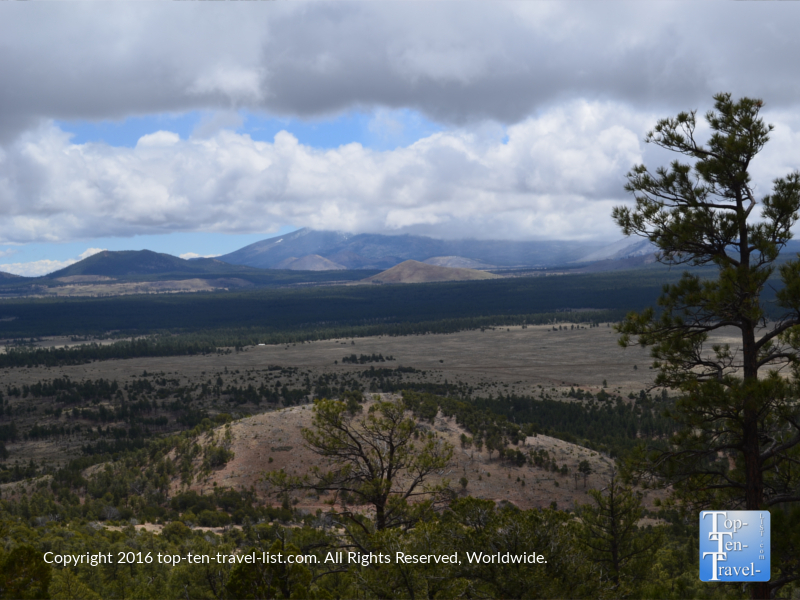 If you were ever to see a bear or mountain lion in the area, I would think Slate Mountain would be one of your best bets due to the secluded setting and diverse plant and animal life. 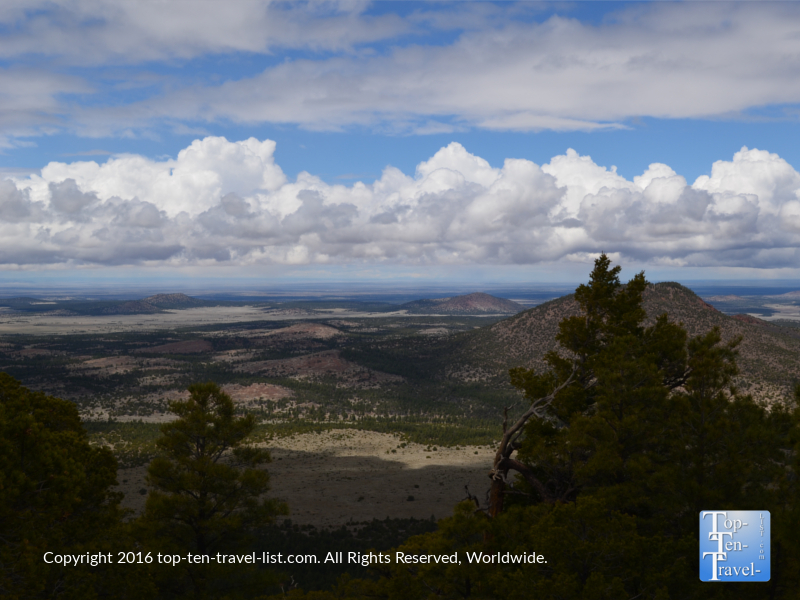 On any given weekend, you will only see a handful of hikers at most. 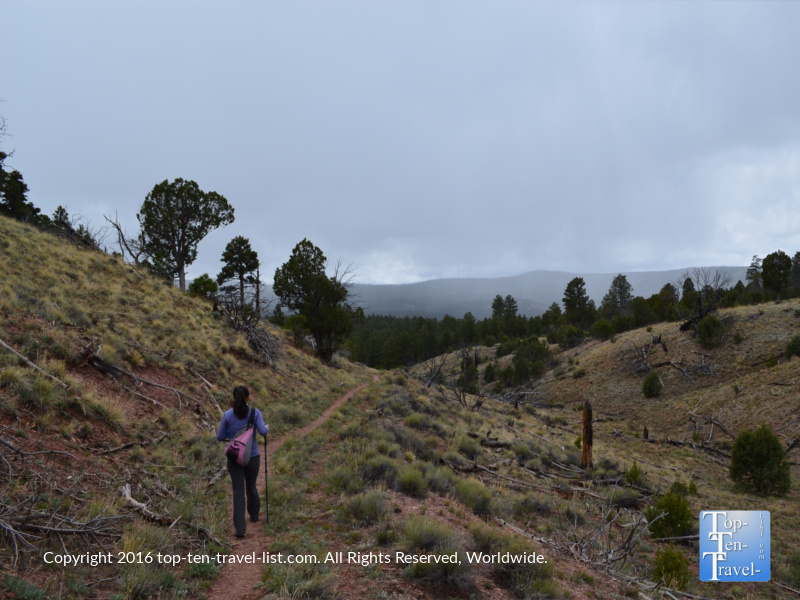 In fact, many times you will be the only one out on the trail. It truly is the hike in the area for any outdoor/nature lover wanting to take advantage of the solitude in such a picturesque setting. It’s the perfect place for photography too with the absence of any crowds blocking the stunning views. 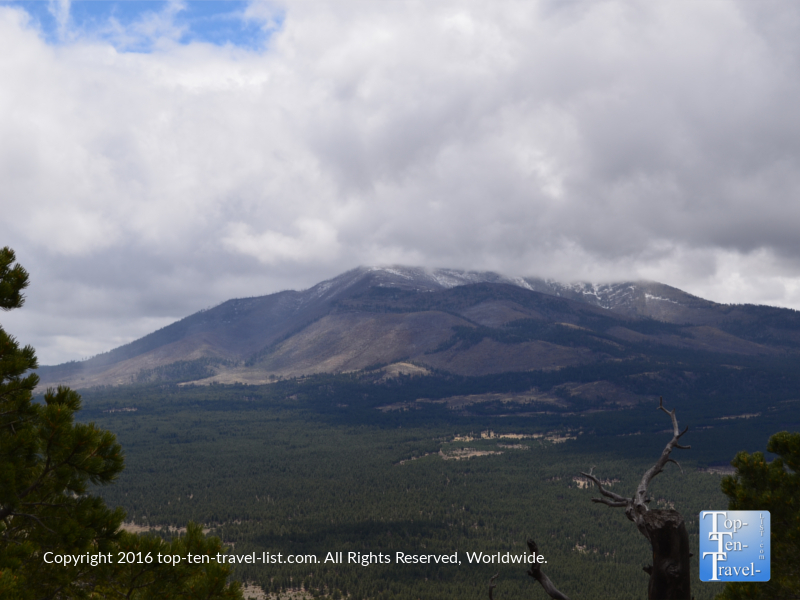 Once you reach the summit, you will be able to gaze out at incredible views of the San Francisco Peaks: by far the most dramatic views from any area hike. We were lucky enough to hike this trail just a few hours prior to a storm, leading to some really fantastic photo opportunities. It even started to snow a bit on our way back (in Mid-May!). 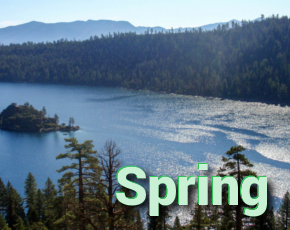 Be aware that the weather can change any time at such a high altitude, and the temps can be much lower than in town. Overall, Slate Mountain is a gorgeous hike for anyone who wants a good workout with incredible views. Being that it is located right off Hwy 180, it’s a nice little side trip on the way to/from the Grand Canyon. 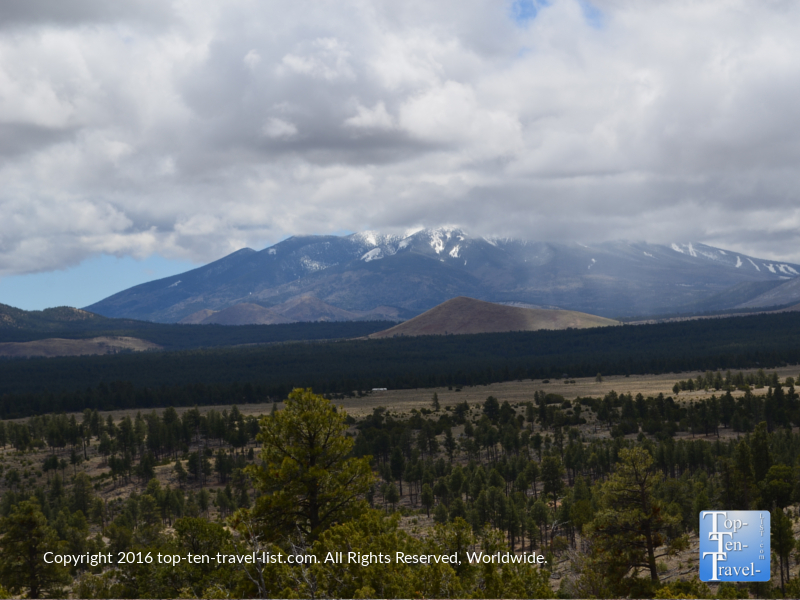 Then again, it’s worthy for a trip of it’s own for anyone looking for something to do while in Flagstaff, as it is that spectacular. I recommend stopping for a espresso drink at Late for the Train, also on Hwy 180, after your hike to warm up and recover a bit. 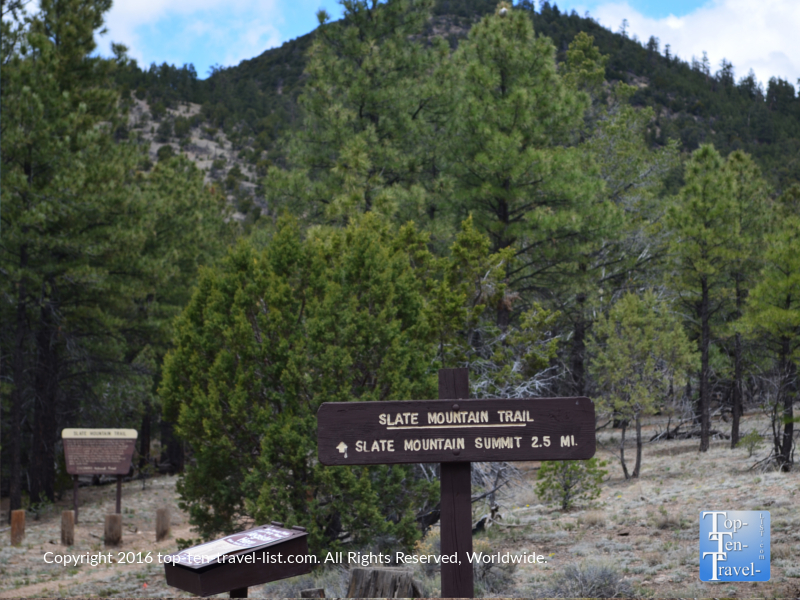 To get to the Slate Mountain Trailhead, you will drive 35 miles north of Flagstaff on US 180. Pay close attention and turn left when you see FR 191 sign (no 191C!). You will drive about a mile or so down 191, which is a gravely road, so drive slow and take it easy if you do not have a high clearance vehicle. There are no fees to park!